Shake Weight - this can't be for real, can it? 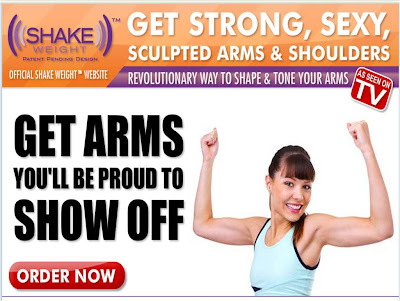 Shake Weight is the 'revolutionary way to shape and tone your arms.' Shake Weight is on www.shakeweight.com and appears to be a genuine e-commerce site. I think, hilariously, it's for real! Brilliant find, Nick. I also think this is actually genuine and with over 170k views on YouTube it's clearly working! Who would have thought that some scantily clad ladies holding a 'shake weight' would have such an impact?! I wonder if any of the views on YouTube have led to sales?